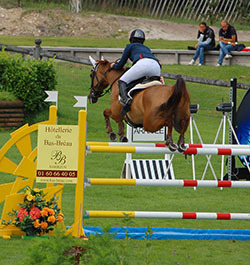 The European Jumping Team Championships took place in the afternoon and there were teams from 11 nations plus some individual riders from other countries. 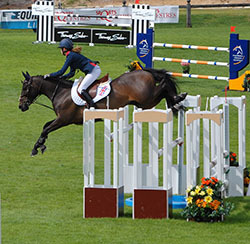 The Championships is a two round "Nations Cup" style competition with the jumps having a maximum height of 1.30m and maximum spread of 1.40m, apart from triple bars where the spread can be up to 1.60m and the Water Jump can be up to 3.30m. Team GB were drawn in fourth place in the running order, and the first British competitors, the experienced Amy Inglis & Nils d'Hurl'vent (Cheval de Selle; Quick Star x Boogie de la Gere), who were members of the 2011 Gold medal winning team, got GB off to a great start with the competition's first clear round. After the first competitor had jumped for each nation, there was only one other clear (for Germany) and the Danish team rider had been eliminated for falling off. 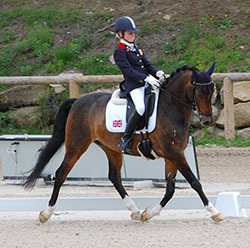 With the first three riders of the second round scoring 20, 16 and 8 faults, it was great to watch 14 year old Millie Allen & her father's 9 year old mare, Song Girl (breeding not recorded), produce GB's second clear round. GB individuals, Beth Adams & Some like it Hot (breeding not recorded), were the next but one to jump, and they were going well until the last fence fell, giving them 4 faults. So, at the half way point of the first round, only GB had a zero score and Sweden were the nearest rivals on a score of 4. With the teams running their better riders in the later slots, the scores did start to improve, but clear rounds were still unusual when GB's Alex Chitty & Amilie Jr Z (Zang; Artos Z x Ewout VD Kleine Roost) started their round. 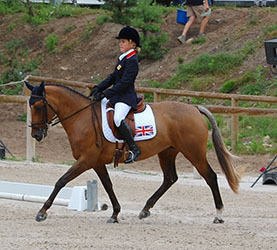 The sole boy on the British team, Alex emulated the girls and were also clear which meant that whatever happened with the final team rider, Jessica Mendoza, GB were going to take a score of zero through to the second round. 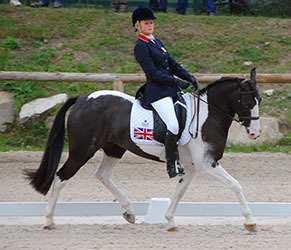 Individual Bronze medallists (as well as Team Gold medallists) in 2011, Jessica & Tixylix (Cavalier x Lauriston) remarkably made it a quartet of clear rounds for GB. So at the end of the 1st round, GB were the only team on a score of zero, then Germany & Sweden both had 4 faults and Denmark had a total 8 to take forward into round 2. The second round took place over the same course of 12 fences (15 jumping efforts) but the course did not seem to get any easier the second time around! The rules are that all of the individual competitors and those whose teams finished outside the top ten in the first round, jump the second round before the competitors for the top 10 teams. 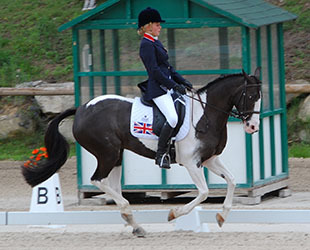 Going in reverse order of merit, this group included GB individuals, Beth & Some Like It Hot, who jumped a lovely clear round so they carry forward a total score of 8 to the individual final on Sunday. It was then onto the top ten teams and the first competitor from lowest ranking team, Finland, was first to jump. 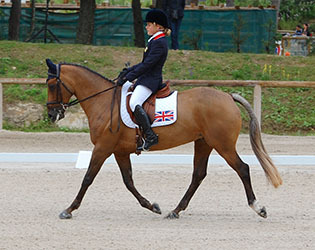 Her 8 faults was repeat by the Irish rider who went in next, then the Belgium rider was eliminated for 2 refusals. Switzerland's Thomas Nussbaumer & Clogherboy Mirah (Connemara; Westside Mirah x Mervyn Kingsmill) then went clear, but the riders from France, Netherlands and Denmark all had 8 faults followed by 4 faults for the first Swedish rider. 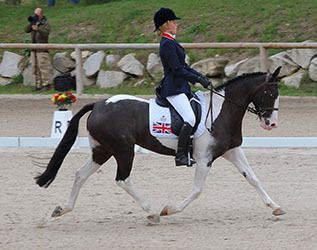 Germany's Marie Schulze Tophoff & Mentos Junior (DRP; Mentos x Downland Folklore) then delighted their supporters with a clear, meaning that as she'd been clear in the first individual round and in the first team round, she takes a zero score forward to Sundays Individual Final. 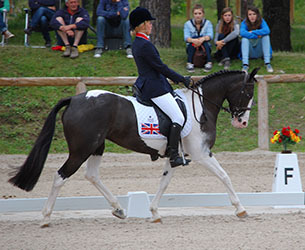 British expectations were high as Amy Inglis and "Morris" entered the arena, but they had a fence down, however, as the lowest team score in each round is discarded, all was not lost! The second team riders also had mixed fortunes. Finland's Elena Hietanen had been eliminated in the first round when Adalmina's Secret (breeding not recorded) refused twice at the first fence and when the mare refused at the first fence in the second round, Elena retired. Germany's hopes dropped when their second rider was eliminated for 2 refusals, while the riders for Ireland, Switzerland and Denmark all went clear - as did Millie Allen and Song Girl for GB. In the third round, there were clears for Belgium and Switzerland (who then had 3 clear rounds in the second round, so a final total of 16 faults). GB's Alex Chitty admitted at the press conference that the pressure got to him, and when he was unlucky going into the double and had the first part down, then panicked and had the next fence down to. 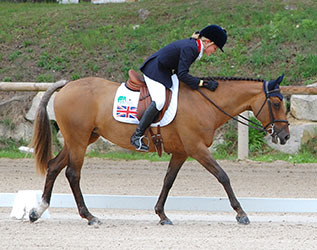 Luckily, he then regained his focus and completed the round without further faults, but the competition had opened up and it looked like the pressure was on the last British rider to improve GB's score of 12 penalties and keep the team ahead of the Swedish and German teams, who could potentially also finish on 12 faults and force a jump off. So into the final round and Finland finished on 60 penalties, Ireland on 44 then Belgium on 24. Switzerland had already got 3 clear rounds, so their fourth rider's 12 faults could be discarded and they stayed on their 1st round score of 16 faults. 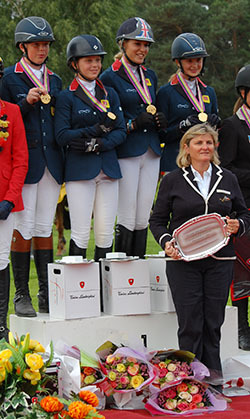 The last French rider disappointed her home crowd by having 4 faults, giving them a final score of 24. 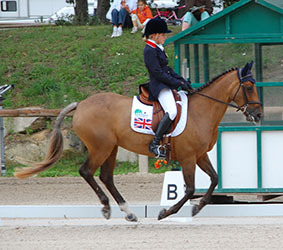 A clear round for the Netherland's Lisa Nooren & the British-bred pony, Rock Dee Jay (AES; Arko III x Northern Park), helped her team to finish in 5th place on 22 penalties and has left her in 8th place going into the Individual Final. A clear for the last Danish rider gave them a team score of 16 and kept the team in contention (and himself in equal 9th place individually). Sadly, the last Swedish rider was eliminated for a fall at the second fence, so his team finished on 24 faults in 6th place. With the last two riders to go, if the German rider had gone clear, they could have finished on 12 faults and put pressure on the last British rider. 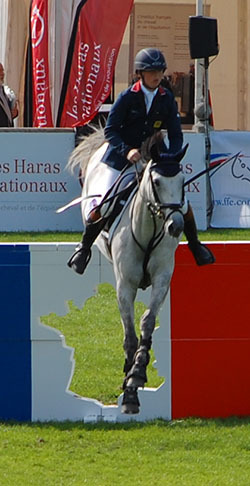 However, Lars Volmer & Carrick (DRP; Calato x Grand Amour) were unable to repeat their first round clear and had the one fence down so Germany joined Denmark and Switzerland in a jump off for the Silver, Bronze and 4th places and without Jessica having to jump, GB were the GOLD medallists for the second year running. The rules for state that, in the jump off, all four of the riders for each team jump a shortened course against the clock and the best 3 scores count. If these total scores are equal, then the time is used to split the teams. Sadly for the Danish team, their first two riders to jump were eliminated, so they dropped out at this point, leaving Germany and Switzerland to battle for the Silver & Bronze. The Swiss chef d'Equipe, admitted afterwards that although they were only expecting to place 5th or 6th, they had walked the jump off course at the start of the competition so they were prepared if necessary. This preparation paid off for their with two of their first three riders jumping clear and the other having 4 faults. This meant that a clear from their last rider would give them a zero score. With 3 of their riders round the course, Germany also needed a clear from their last rider to stay competitive as one of their team had 8 faults, although the other two had gone clear. Tension mounted as the last Swiss rider entered the arena and they got off to a good start. Sadly though, one fence fell and so the last German rider knew that a clear round would secure the Silver medal even if the time was slow. 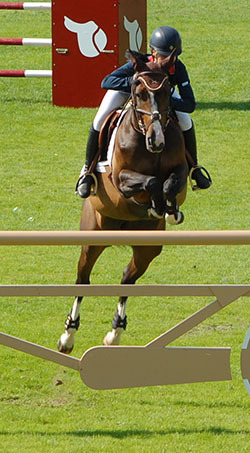 This clear round was achieved and Germany won the Silver medal. 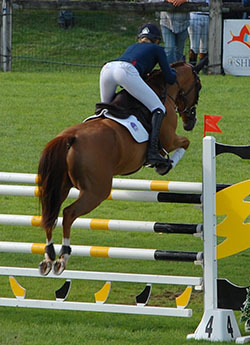 The top ponies and riders compete for the Individual Jumping medals on Sunday and their scores in the first individual qualifying round and in both of the team rounds are carried forward. 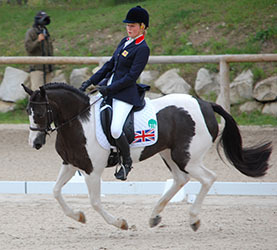 The British riders are well placed, especially Millie Allen who, along with Germany's Marie Schulze Topphof, goes through with a zero score. Beth Adams & Some like it Hot clear the last fence in the 2nd round. At the end of the first day, the British team were in second place, just 1.3 penalties behind the Irish, with Germany in third. Individually, team members, Charlotte and Louisa were in 3rd and 5th places respectively and the individuals, Annie in 7th and Yasmin in 10th. 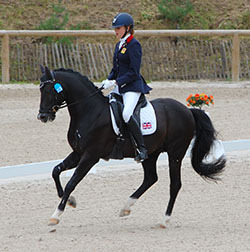 Today, Madeleine Taylor & Bandalera (Welsh PB; Ski Dancer x Corston Comet) were the first of the British Eventing team to do their dressage and are pictured during their canter circle that earned then the good marks of 8 7 8. Their overall score of 70.14 % (44.8 penalties) put them into 2nd place and lifted the British team above Ireland in the team rankings at this point. 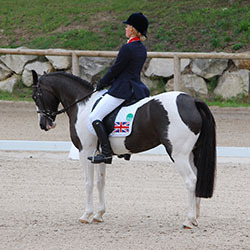 Final team members, Janou Bleekman & the striking piebald mare, Cregann Scenic (breeding not recorded), scored 66.81% (49.8 penalties) and finished the dressage phase in 13th place. One of the highlights of their test was a lovely square final halt, which was rewarded with a 9 by the judge at E.
At the end of the dressage phase, Ireland maintained the lead, 6.3 penalties ahead of GB. Germany are 12.1 penalties behind Ireland in 3rd, followed by France, Belgium, Italy, Holland, Denmark and Switzerland. The XC starts at 2pm French time (1pm UK time) tomorrow (Saturday) and will be shown live on the internet, on the EuroPoney TV channel. 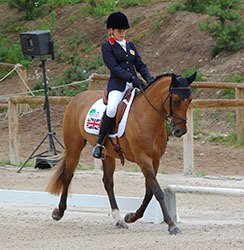 Click here for more pictures of the Eventing ponies, for more pictures of ponies form other countries, look on Facebook. As well as the Team medals, there are two sets of individual medals to be fought for by the dressage competitors and the first of these medals are awarded for the Pony Individual Test. 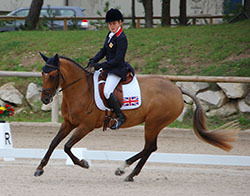 For the first time at a European Championships, all of the riders and ponies compete in this class (previously only the top 25 after the team test were allowed to). Scores from the team test are discarded so all have a fresh chance. Run over two days and with a random draw for starting order, it was Maisie Scruton and SPSS Elite graded stallion, Rembrandt DDH (DRP; Renoir x Viktoria's Chirac) who went first for GB. An early draw is always hard in these competitions, and Maisie was only the third competitor to start in the class and the judges seemed quite cautious with their allocation of marks. As a result, despite performing a mistake free and much more forward test, this was not reflected in higher marks and they finished on 69.195% for 10th place at the end of the day. Phoebe Peters & SL Lucci (Lukas x Bazar) were luckier in the draw and competed in the middle of this session. Phoebe and Lucci are a new partnership as Lucci was on the 2011 Danish Bronze medal winning team and Lucci's previous owner did some counting and informed Phoebe that Lucci had been with her just 150 days! Phoebe & Lucci have achieved an excellent partnership in this short time and despite him being unsettled by the cheers as the competitor before left the arena, Phoebe quickly regained his attention and focus. The judges opinions on the test varied from the French judge at E having them on 68.171% and in 12th place, to the Dutch judge at E (who sees a very similar view of the test) having them on 70.976% and in 5th place!! Averaged out across all 5 judges, their score was 70.438% and left them in 7th place overnight. Last of the British riders in this first session was Hariette Williams with Madam's Miss Maria (NWPCS; Woldhoeve's Silco x Wester Aikema's Norbert). Hariette rode well to produce a pleasing test from this 7 year old pony who is not only in her first year at this level but had time out of training in 2009 to have a filly foal (by SPSS Elite sire Caesar 171). Their score of 67.512% left them in 12th place overnight.